Iowa State Quarters are the 29th variety in a series of fifty design changes over a ten year period from 1999 to 2008. This Quarter was released into circulation on August 30, 2004. 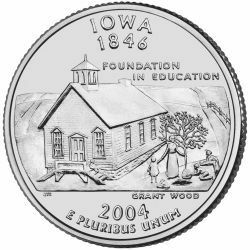 The reverse of the Iowa quarter is based on a painting by Grant Wood, whose name appears on the coin. Arbor Day is the name of the painting and it shows a schoolhouse with a teacher and group of children planting a tree. The reverse of the coin bears the inscriptions "IOWA 1846”, "FOUNDATION IN EDUCATION" and "E PLURIBUS UNUM" along with the date of 2004.